Over the years, instant tents are getting attention for their easy setup and less hassle. However, with the many instant tents to choose from, it can still be quite overwhelming to find the right one. What features should you look for and how much should you be spending? 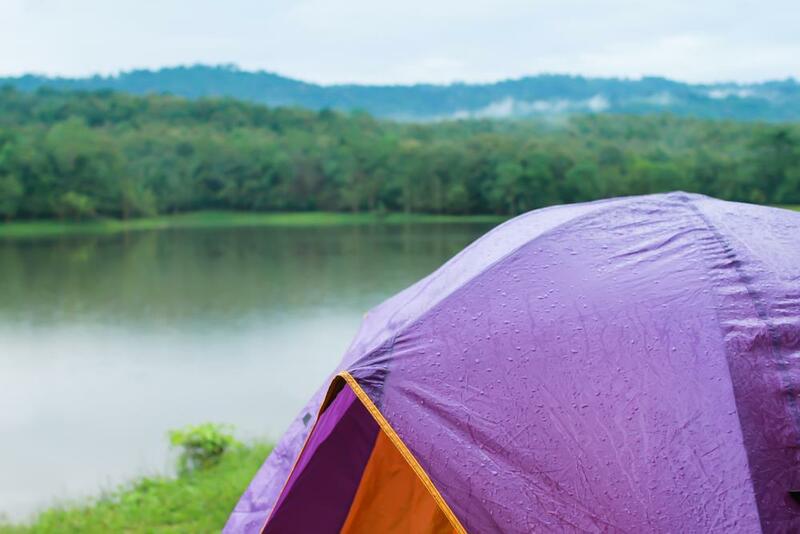 Here’s a guide to help you find the best instant tent for camping. What is the Best Instant Tent for Camping? One of the things you would consider when getting a tent is the ease of use. Obviously, instants are easier to use because the frame system is already built-in. There would be no need to insert poles through holes. Some will pop﻿﻿-﻿﻿up on their own, while others will require you to extend and lock the poles. 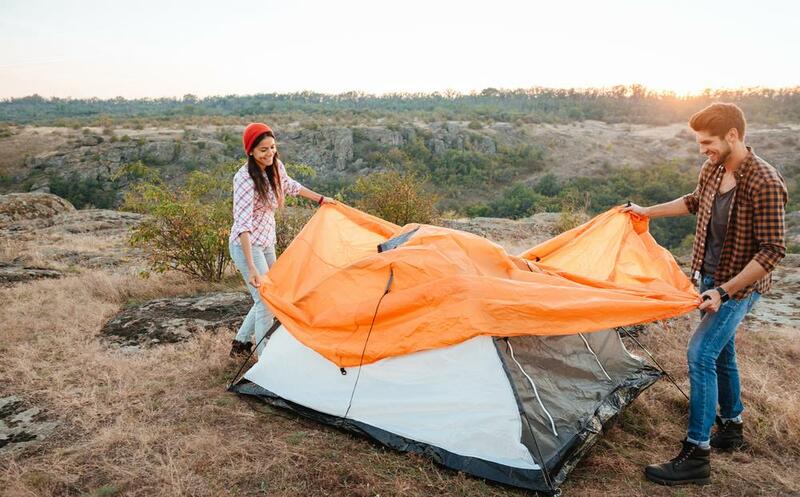 With instant tents, you will use less time to set up and more time for other fun outdoor activities. In fact, many instant tents will only take less than a minute to set up. This is advantageous, especially when the weather is unfavorable (such as rain). During unfortunate events that it rains before you've set camp, an instant tent can be such a lifesaver. Instant tents are also great for beach trips and festivals for extra sun protection and privacy. They are also popular families with young children because it can be used as a playhouse or backyard fun all year long. Knowing your purpose for buying an instant tent can make the process much easier. Since there are so many instant tents in the market, you can narrow down your choices using your purpose as your guide. Do you want an instant tent for camping, the beach, a festival, backpacking, etc.? 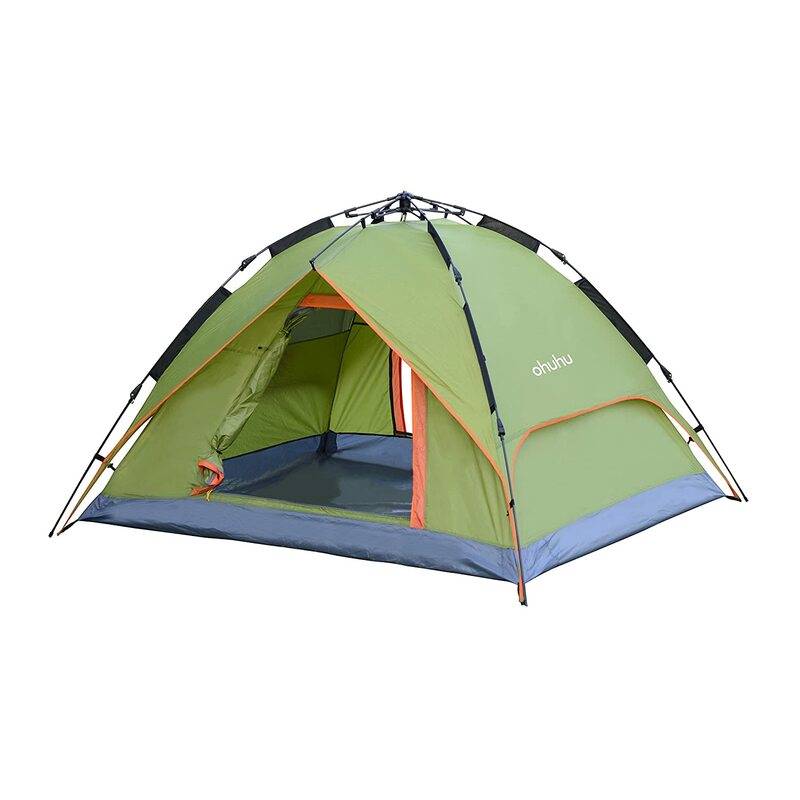 Instant tent in the market also vary a lot, so when you identify what you’ll use it for, you can find one to suit it. Knowing what you’ll use the tent for is important because it affects a lot of your other decisions. For instance, if you’re using it for backpacking and camping, you’ll probably want a tent that’s lightweight. The size of the tent is another important consideration to take. How many people will sleep in the tent? Do you have things you will place inside as well? Size matters a lot because it affects portability and comfort. Carrying a tent in your car is no problem. However, if you're backpacking and carrying it on your back, then you'll want to reconsider the size and weight of your tent. When considering the durability of your tent, you're really looking at the pole material and also the fabric. Poles are usually made of aluminum, fiberglass, or carbon fiber. For fair weather camping, fiberglass poles will do fine. They are affordable, but a lot heavier and less durable than aluminum and carbon fiber. Aluminum poles are light and strong. They are also the most durable among the three. Also, it's easy to find a replacement should they break or get lost. However, for a lighter and stronger option, you can opt for carbon fiber. Tents are usually good for three seasons or all four. Three season tents can withstand strong winds, but not snow. The walls usually have mesh material, which provides good ventilation and enough protection. Four season tents can withstand tougher conditions, including snow. They're usually low and boulder-like in shape to help with strong winds and shed snow. The point of instant tents is to make the setup and packing away processes easier. However, it still varies from tent to tent. Some pop-up just by throwing them in the air, while others require you to extend and lock the poles. You should also consider the packing away process. Pop-up tents are not as easy to keep than they are to set up. You need to familiarize yourself with the folds and turns when keeping them so that you won’t damage the poles. Doors come in different shapes and sizes, so you might want to take a look at it too. What are the zippers made of? What’s the orientation of the doors? How many doors are there? Some tents will have multiple doors to avoid climbing over each other in the middle of the night for a bathroom visit. A rainfly helps keep the inside of the tent dry during rain. It also keeps you dry from early morning dew, which is inevitable. You can also use it anytime you want a little more warmth inside the tent. Read more: 5 Of The Best Winter Tents To Beat The Cold Weather ! Make sure there are mesh panels on the ceiling, doors, and windows for air circulation. They also allow you to see outside of the tent while keeping the bugs out. If you plan on camping in a warm and humid location, then you might want to have larger mesh panels on your tent. Loops on the ceiling are useful for hanging lanterns and other things, while the pockets allow you to keep your tent tidier. Avoid digging through your bags. Put the items you want to have easy access to in the pockets. 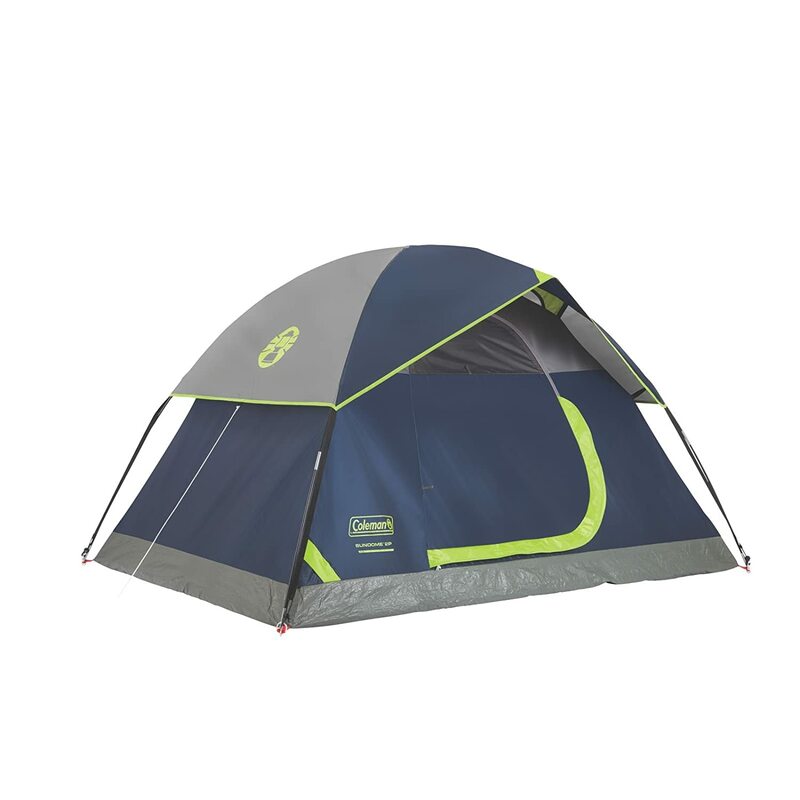 Coleman is one of the popular outdoor companies and tents are one of their main sells. This 4 person tent is built to withstand strong winds and rain, so it's a great choice for multi-weather camping. The pre-assembled poles make assembly quite easy. You only have to extend the poles until it locks into each other. The peak height is 4 feet and 11 inches at the center, which is a lot of room for comfort. However, if you want more room for more people, you can get a larger size. The tent comes with a rainfly for extra protection, a carry bag, and a 1-year limited warranty. The reflective guy lines help with visibility at night. Some heavy duty vinyl type fabric keeps the tent well-ventilated, and it's also easy to clean. It takes about a minute to set up. You just have to spread the tent out and extend the poles to lock. You can use the tent for fair weather camping and light-medium rain. However, it’s a good idea to use with caution in strong winds and rain. It’s a little too bulky for backpacking, but it works well for car camping and family camping. The steel poles are quite heavy, but they are strong. Getting dust or sand out can be frustrating. The Core Instant 4-Person Cabin Tent offers a hassle-free setup which takes only 60 seconds or less! All you need to do is unpack it, unfold the tent and extend the poles. It uses a water repellant fabric that allows water runoff to be faster. The seams are sealed for more protection, and the doors and windows are also rain-resistant. The tent comes with a removable rain fly and the mesh ceiling and windows allow for better air circulation. It helps keep you cool in warm weather. 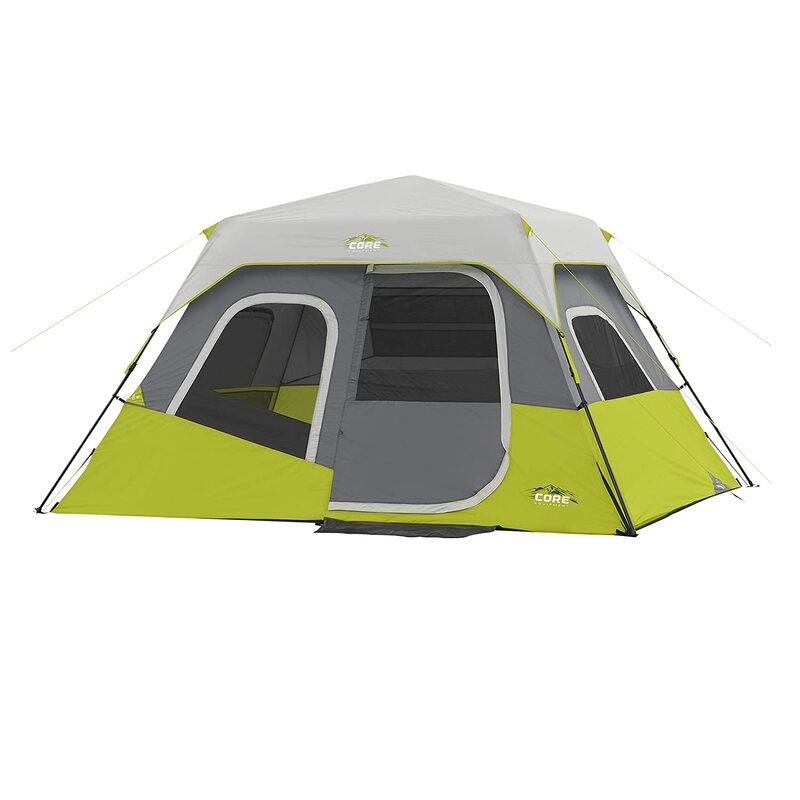 The tent is large enough to fit two queen-sized beds and has a 72-inch peak center height. If you want privacy, you can zip up the privacy panels on the doors and windows. If you like this tent but want a smaller size, consider getting the three-person or four-person instant dome tent. It’s more ideal for backpacking because it’s smaller and lighter. Setting up the tent is as easy as unpacking, unfolding and extending the poles. There are privacy panels which you can open or close. The mesh windows allow air to come in while keeping the bugs out. Great for fair weather and light to medium wind, rainfall, and snowfall. It can withstand strong winds, but you should still take caution. It has an electric cord outlet which you can close if you’re not using it. It has a lantern hook/loop and pockets. Packing it back in its bag can be tricky, but it doesn’t take long. Apparently has chemicals known to the Californian State to cause cancer, birth defects, and reproductive harm. 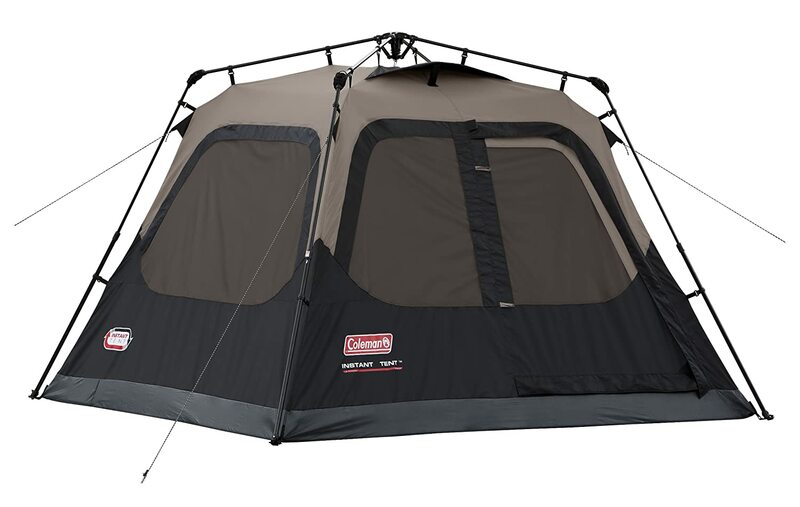 The Coleman Sundome is a great backpacker tent because it's light and easy to set up. It sleeps two people or one person with backpacking gear. The doors are of a good size so you can walk in and out comfortably, which can be kept open with the mesh fly for more ventilation. On the opposite of the door is a large window for air to go through. The floor is polyethylene, and it has welded seams to prevent water from seeping in. It uses fiberglass for the poles, and it comes with polyester fabric walls and a fly. Very easy setup. In fact, it takes less than a minute to do so. Aside from the mesh on the roof and windows, it has a ground vent for more ventilation. The tent features an electrical access port, a loop for lanterns, and interior storage pockets. The material is fire retardant for better safety. Fiberglass poles are not very durable. It may become brittle in extreme temperatures, especially cold. While it says it can withstand heavy rains, it may leak if it’s too strong. Better have rain covers and a tarp. Considering the size, it is quite heavy. Teton, as a brand, is popular for outdoor stuff such as tents, cots, backpacks, etc. This instant tent sets up in minutes: Unfold or roll it out, extend and lock the poles, then pull the drawstring. But even if it seems very simple, it is still a very strong and durable tent. It’s great for solo backpackers because it is lightweight and durable. You can match it with a cot camp pad, and other accessories but those don't come with the package. The large door makes entering and exiting easy, and you can keep the inside dry with the vestibule. It won’t be too comfortable for tall people. However, you can get a different size if you like, but that would cost and weigh more. The tent bottom is durable and waterproof. You can set directly on the ground or on a cot. Comes only in the color orange, which is unfortunate for those who don’t fancy the color. 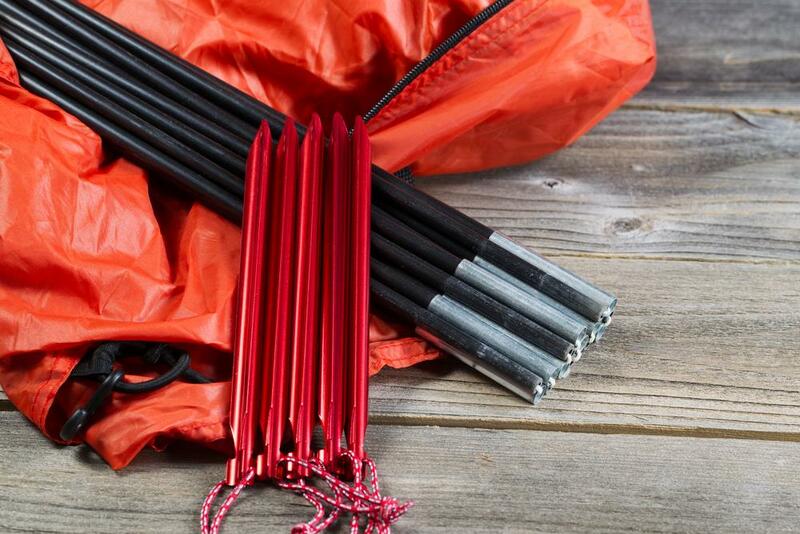 The Ohuhu 3 person tent comes with eight strong steel pegs. It also comes with four ropes to keep the tent sturdy and anchored. The two-door design allows for better air movement and also makes entering and exiting easy. This tent is also great for the beach or picnics. Strong support and frame system because it uses aluminum. It’s lightweight. The tent is great for fair weather camping but also for light wind and rain. It’s very easy to set up, and it’s pretty great considering it’s only around 60 bucks. There is a loop for a lantern and two pockets inside to keep things organized. It’s quite tight for three people. In fact, it’s even tight for two people. Water may leak in the corners, especially in heavy rain. Instant tents are great for camping because it allows a less hassle setting up process. Each tent on this list have their sets of pros and cons, but it also depends on what you are using it for. Make sure you consider your purpose, the size, season, portability, durability, and ease of use. If you have questions or comments on the tents on this list, feel free to use the comment section below.